A neurodynamic assessment evaluates the length and mobility of various components of the nervous system. They are performed by the therapist placing progressively more tension on the component of the nervous system that is being tested and are divided into upper and lower limb tests. The Upper Limb Tension Tests (ULTTs) are also known as Brachial Plexus Tension or Elvey Test.These tests are designed to put stress on neurological structures of upper limb. These tests were first described by Elvey and hence also known as Elvey test but most commonly called ULTT. The shoulder,elbow, forearm,wrist and fingers are kept in specific position to put stress on particular nerve (nerve bias) and further modification in position of each joint is done as "sensitizer". The ULTT's are equivalent to the straight leg raise designed for the lumbar spine. These tension tests are performed to check the peripheral nerve compression or as a part of neurodynamic assessment. The main reason for using a ULTT is to check cervical radiculopathy. These tests are both diagnostic and therapeutic. Once the diagnosis of cervical radiculopathy is made the tests are done to mobilise the entrapped nerve. Each test is done on the normal/asymptomatic side first. Traditionally for the upper limb, the order of joint positioning is shoulder followed by forearm, wrist, fingers, and lastly elbow. Each joint positioning component is added until the pain is provoked or symptoms are reproduced. To further sensitize the upper limb tests, side flexion of cervical spine can be added. If pain is provoked in the very initial position, then there is no need to add further sensitizers. If pain or sensations of tingling or numbness are experienced at any stage during movement into the test position or during addition of sensitization maneuvers, particularly reproduction of neck, shoulder or arm symptoms, the test is positive; this confirms a degree of mechanical interference affecting neural structures. See here for more info on this test. Purpose: To assess the contribution of neural tension to the patient's symptoms. Performing the Test: Patient actively performs upper cervical nod. Examiner passively flexes lower cervical spine. A reproduction of pain or other neural symptoms in the thoracic spine is a positive test. A stretching sensation is normal. Importance of Test: As nerves run through the various tissues of our body, they can become adherent to some of the structures they pass. This test looks to reproduce these symptoms by placing the spinal cord on tension via cervical flexion. 1. Physiotherapists must keep in mind that aggravating upper limb symptoms is much easier than those in the lower limbs. This is because the nerves are weaker and has more complex courses in the upper limbs. 2. The test is involving many joints and muscles. Hence, it is complex and it might be easy to forget that one of these structures could get irritated during the test. 1. Performing physical examination is inappropriate for either physical or psychosocial reasons. 2. Severe pain in which the examination could unnecessarily provoke the patient’s symptoms. 3. There is a heavy bias towards psychosocial issues. 4. The pain is unstable, irritable, hypersensitive. 1. The patient has symptoms anywhere in the head, arms, neck and thoracic spine. 2. the symptoms are not severe and the problem is not easily provoked. 3. Neurological symptoms are completely absent or only a minor part of the condition and those neurological symptoms are stable, not easily provoked and intermittent. 4. The problem is stable and not rapidly deteriorating. 5. The pain is not severe at the time of examination and there is no latency in terms of symptoms provoking. 1. A deep ache or stretch in the cubital fossa extending downwards to the anterior radial aspect of the forearm and hand. 2. A definite tingling sensation the first three fingers and thumb. 3. A stretch in the anterior shoulder aspect. 4. Cervical lateral flexion away from the tested side increases the test’s response. 5. Cervical lateral flexion towards the tested side decreases the test’s response. The reliability and validity is different for different test which can be seen here. This presentation, created by Jason Grandeo, as part of the Evidence in Motion OMPT Fellowship, reviews 1) the biomechanical and pathophysiological properties of nerve,2) the indications for using upper-limb neurodynamic tests, 3) normal sensory responses for each of the upper limb neurodynamic tests, 4) the validity of the upper limb neurodynamic tests, and 5) positive findings with upper limb neurodynamic tests. 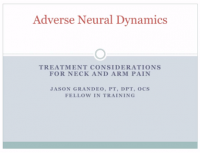 This presentation, created by Jason Grandeo, as part of the Evidence in Motion OMPT Fellowship, 1) reviews the current literature on treating adverse neural dynamics in the upper extremity, 2) describes interventions used to treat individuals with positive neural dynamic tests for median, ulnar and radial nerves, and 3) discusses the need for future research to guide physical therapist clinical reasoning when treating individuals presenting with signs of adverse neural dynamics in the upper extremity. ↑ Magee DJ.Orthopaedic physical assessment.5th edition.Elsevier publication. ↑ Elvey RL: The investigation of arm pain. In Boyling JD, Palastanga N (eds): Grieve’s modern manual therapy: the vertebral column, 2nd ed. Edinburgh, 1994, Churchill Livingstone. ↑ 3.0 3.1 3.2 3.3 3.4 Butler DS: Mobilisation of the nervous system, Melbourne, 1991, Churchill Livingstone. ↑ Wells P. Cervical dysfunction and shoulder problems. Physiotherapy, 1982; 68: 66-73. ↑ 10.0 10.1 10.2 10.3 10.4 Shacklock M. Clinical neurodynamics: a new system of neuromusculoskeletal treatment. Elsevier Health Sciences; 2005 May 6.